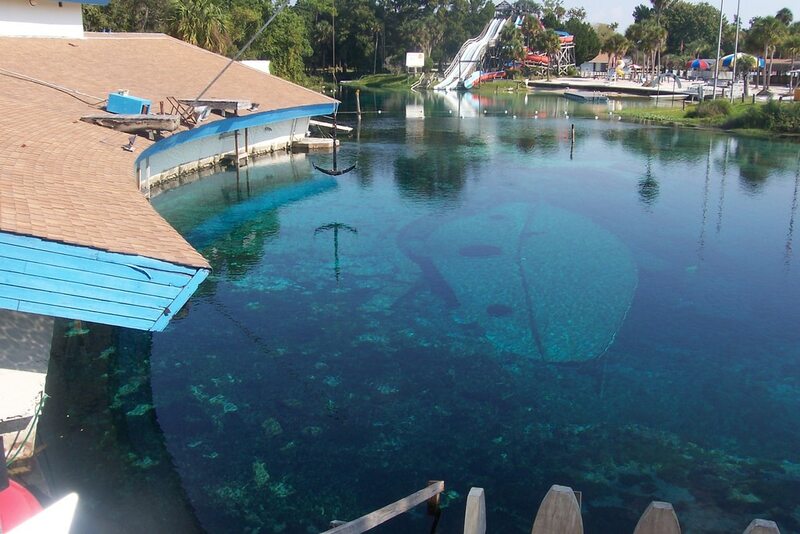 There are many giant springs in Florida. Weeki Wachee Springs though are special – more than 70 years here operates unique underwater show of mermaids. The unusual name of Weeki Wachee Spring comes from the Seminole language and means “little spring”. The name does not correspond to reality: this spring has incredible size! It starts in a 50 by 64 meters wide pond, which is up to 56 meters deep. At the deepest place is seen an opening into a deeper cave and all the water gushes out from this hole. There even is seen a bulge on the surface of the pond. The temperature of the water is 23.7 °C. The power of the stream prevents the exploration of the cave. Sometimes, though, the power of the stream decreases and cave divers have a possibility to go deeper in the cave. Up to 2017 there have been explored cave passages with a total length of 7,260 m – cave divers managed to link the Weeki Wachee Cave and the nearby Twin Dees (Twin D’s) Cave System in 2014. By the way, this link between the caves is located under the highway. This cave system – Weeki Wachee – Twin Dees Cave System – is the deepest submerged cave in the United States – it has been dived up to 124 meters deep. 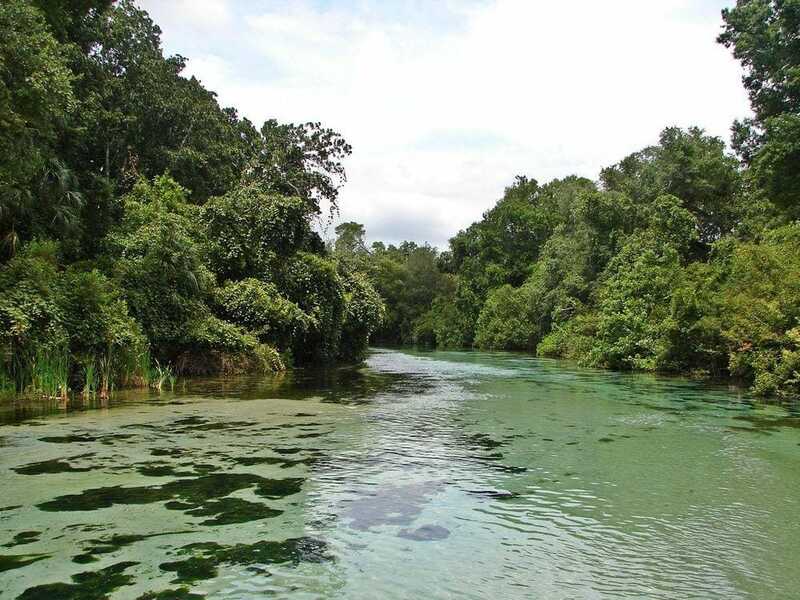 As the spring leaves the pond, it forms large, but short river – Weeki Wachee River, which after some 12 km reaches the Gulf of Mexico. Many visitors to the park take a trip with a small ship or canoe to admire the unusual lucidity of the water and lush nature around the stream. Newton Perry, former U.S. Navy soldier, and stunt swimmer had a crazy idea in 1940ies – to create an underwater show in the springs. 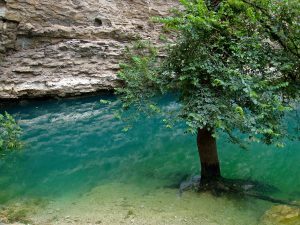 The incredibly clear water of the spring allowed to see far through it and the pool was large and deep enough to allow such shows. Together with partners and many local activists, he cleaned the pond of garbage – such as old refrigerators and abandoned cars. 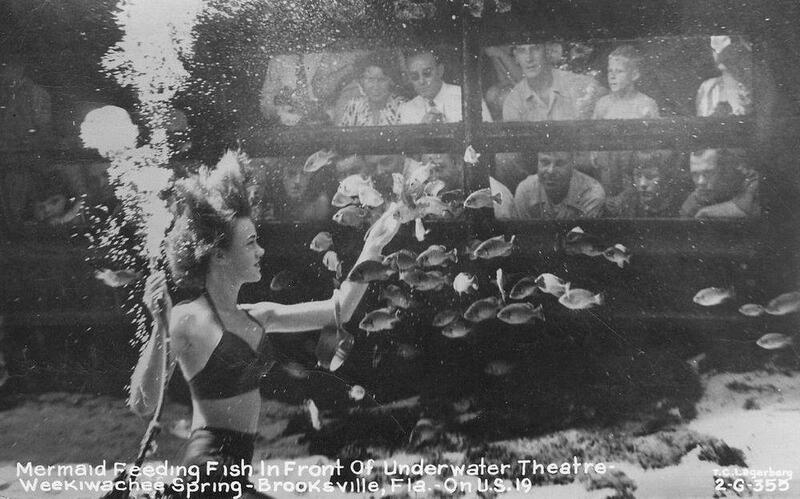 On October 13, 1947, the first show of the underwater theater opened. Spectators had the opportunity to look through windows to the natural beauty of the spring basin and “mermaids” – girls performing under the water. Selected local girls were just living under the water – sitting around the tables, eating, drinking, typing, painting. These simple activities later turned into elaborate shows. The main danger was created by the alligators – thus there was a guard sitting at the river and trying to spot them. At these times this was a quiet rural area and such an idea was extravagant by any account. Nevertheless, times were changing, more and more tourists were coming and the business turned out to be a success. Soon after this unusual show became world famous, the park more affluent and new attractions were added – orchid garden, jungle cruises, and others. In 1959 Weeki Wachee was purchased by the American Broadcasting Co. (ABC) and was heavily promoted. There was built a new underwater theater and up to 35 mermaids were employed in the springs. Since 2006 there “appeared” also mermen. 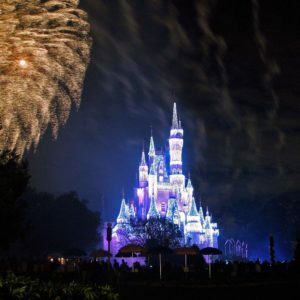 Now the park is owned by the Florida Department of Environmental Protection, the mermaid show continues and the park is visited by some 200 thousand visitors every year. Over these years more than 300 mermaids have worked in springs. This has been demanding, hard and at the same time highly unusual and creative profession. Weeki Wachee Mermaid show is a unique, local tradition, a part of Florida’s cultural heritage. Weeki Wachee Springs State Park, last visited in January 27, 2019. Weeki Wachee Springs, Department of Environmental Protection, Florida. Last visited in January 27, 2019. Florida is the tropical paradise of mainland United States. Over the last century, it has experienced fabulous changes, turning from forgotten, swampy badland into densely populated and rich land. Highlights of Florida include the architecture of the late 19th and 20th century as well as its giant springs and caves. 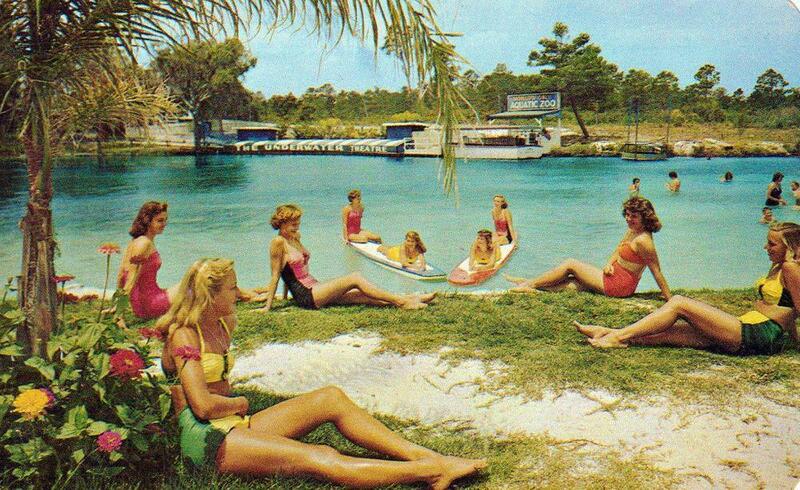 In the postwar explosion of domestic tourism, Weeki Wachee spring offered the quintessential vacation fantasy, a city of colorful mermaids in a natural crystal spring right off the West Coast highway in a sparsely inhabited Florida. In those early days, the mermaids had to stand alongside the highway to flag travelers down, but once word of their charms got out, travelers headed south to playgrounds in Miami, Ft. Lauderdale, and Tampa found Weeki Wachee a tantalizing detour from the grueling two-lane road connecting vacationland with the work-a-day world to the north. Vickers shows how that local novelty became a stellar international attraction. In the 1930s, the Federal Writers’ Project sent mostly anonymous writers, but also Zora Neale Hurston and Stetson Kennedy, into the depths of Florida to reveal its splendor to the world. The FWP and the State of Florida jointly published the results as Florida: A Guide to the Southernmost State, which included twenty-two driving tours of the state’s main roads. Eventually, after Eisenhower built the interstates, drivers bypassed the small towns that thrived along these roads in favor of making better time. Those main roads are now the state’s backroads—forgotten by all but local residents, a few commuters, and dedicated road-trippers. Retracing the original routes in the Guide, Cathy Salustri rekindles our notions of paradise by bringing a modern eye to the historic travelogues.